Such a wonderful collage of photos!! 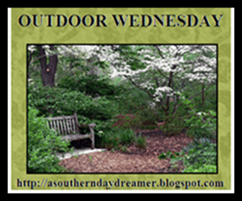 My Outdoor Wednesday is now posted. It’s a slideshow of our Star’s Walk of Fame. Come by and view if you can. I’d love to have your company…. Wow, you captured that little spider, and look at that sneeky squirrel invading the bird feeder. Lovely collage. I love your outdoor shots!! Great photos – thanks for sharing. Oh, what a joy it is to have these visitors to our yards! Great photos in a lovely mosaic. Your mosaic is just spectacular. Thank you for sharing it with us. Great outdoor shots! I love the one of the squirrel in the bird feeder…I don’t think the birds like it though!